I had already heard about Rabbi Capers Funnye when I looked at Congregation Ahavas Israel's monthly newsletter a few months ago. The only Conservative synagogue in Grand Rapids, Michigan advertised their upcoming scholar-in-residence weekend on the front page of their congregation's bulletin. This past November, they invited Rabbi Capers Funnye, the head rabbi of the mostly African-American 200 member Beth Shalom B’nai Zaken Ethiopian Hebrew Congregation in Chicago (He also serves as a senior research associate for the Institute of Jewish and Community Research in San Francisco). The Black rabbi spoke at the Grand Rapids shul on Shabbat and then at a local church on Sunday. The only thing that surprised me about seeing this upcoming program was: Why hadn't other synagogues thought of this? After all, this is First Lady Michelle Obama's cousin! Well, this certainly wasn't to be Rabbi Funnye's last time speaking in a white suburban congregation. As my friend Zev Chafets reports in this weekend's New York Times Magazine ("Barack Obama's Rabbi"), Rabbi Funnye and his wife chose to celebrate Martin Luther King Day at the Stephen Wise Free Synagogue, a mainstream NYC Reform congregation, rather than attend pre-inauguration festivities in D.C. for Funnye's relative Barack Obama. 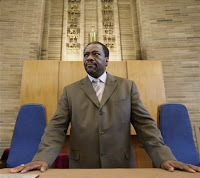 Chafets writes an enlightening article about Rabbi Funnye and the Black Judaism that he embraces. Just how close are the Funnye's and Obama's? Well, as Chafets writes, they seem to have reunited at Barack and Michelle's wedding. And due to their "common interest in community organizing in Chicago, they saw each other often, socially and professionally". Capers and Mary Funnye also had VIP reserved seats during President Obama's inaugural speech when they sat among Oprah Winfrey, Steven Spielberg, and close family members. When the news of Michelle Obama's black rabbi cousin broke, there were many in the Jewish community who weren't sure what to think about this revelation. Was it a secret? Is he close with Barack? Is he really a rabbi? Is he really Jewish? I think the NYT Magazine article by Chafets will clear that up once and for all, especially considering the title of the piece: "Obama's Rabbi". And there are a couple other rabbis who may lay claim to being the rabbinic advisor to the Commander in Chief. Rabbi Jack Moline, a Conservative rabbi in Alexandria, Virginia is probably the most well-connected rabbi in the Beltway with the exception of Rabbi David Saperstein of the Reform Movement's RAC (Religious Action Committee). Moline's close ties to Rahm Emanuel could certainly put him in the running to be Obama's rabbi in D.C. And Rabbi Asher Lopatin (left), Rahm Emanuel's rabbi in Chicago, could also get President Obama's ear when he wants it (at least indirectly through the Chief of Staff). So, with three rabbis with close connections to the president, it is surprising that none of these rabbis (Funnye, Moline, or Lopatin) made Newsweek's list of the most influential rabbis for 2009. The recently released list is made up of most of the usual suspects who have graced the list since its inception in 2007, as well as some newbies. Maybe Rabbi Capers Funnye is too "outside the mainstream" to be included in the list one might say. Well, to that I offer Yehuda Berg (#13), the head of the "cultish" Kabbalah Center in Los Angeles, who includes non-Jews Madonna, Lindsey Lohan, and Ashton Kutcher among his balabatim and offers a free lucky red-string to visitors of his website. While Rabbis Moline and Lopatin didn't make the list either (probably because they are not based in LA or NY), there are a few influential rabbis on the list for the first time who are quite deserving. It was nice to see Rabbi Jill Jacobs (right) of Jewish Funds for Justice and Rabbi Elie Kaunfer (founder of Mechon Hadar and Kehillat Hadar) on the list for the first time. It was not surprising to see that Rabbi Menachem Genack, the head of the Orthodox Union's kosher division, made the list this year. However, Rabbi Morris Allen (Hekhsher Tzedek) was notably absent. I was also happy, but not surprised, to see that Rabbi Steve Gutow (Jewish Council for Public Affairs) made the list at #20 this year. I was thrilled to see Rabbi Daniel Brenner on the list for the first time. I worked with Daniel at CLAL, when I served an internship there in 2001. He is now the director of Birthright Next, a program that keeps tabs on alumni of the Taglit-Birthright Israel program and helps these young people get more involved in the Jewish community. Daniel is a very talented guy and very deserving of this honor. Other CLAL figureheads on the list this year include Rabbi Irwin Kula (#7 in 2008; #12 in 2009) and Rabbi Brad Hirschfield (moving from #39 to #42). Each year this list comes with the usual kvetches from the Jewish community. It's a silly list everyone argues. And it probably is a bit silly since there are no statistics one can use to measure the influence of rabbis in our country. It's also difficult to compare all these rabbis who have such different functions within the community (academics, fundraising, community organizing, kashrut policing, book publishing, etc.) But, as always, it makes for interesting conversation and debate. Jeffrey Goldberg annotates the Newsweek list of America's most influential rabbis with comments on the rabbis that he knows, has met, or has heard of. Goldberg's "Annotated Guide to American's Top Rabbis" is located here. My two favorite comments that Goldberg makes are about my friends and teachers Irwin Kula ("I met him in Aspen. He's the sort of rabbi who shows up in Aspen") and Hayim Herring ("Married to Shulamit Sturgeon"). Funny stuff! Reb Jason -- Thanks for the shout out. I am dreaming that they will bring all 50 rabbis together for a Battle of the Network Stars type extravaganza.